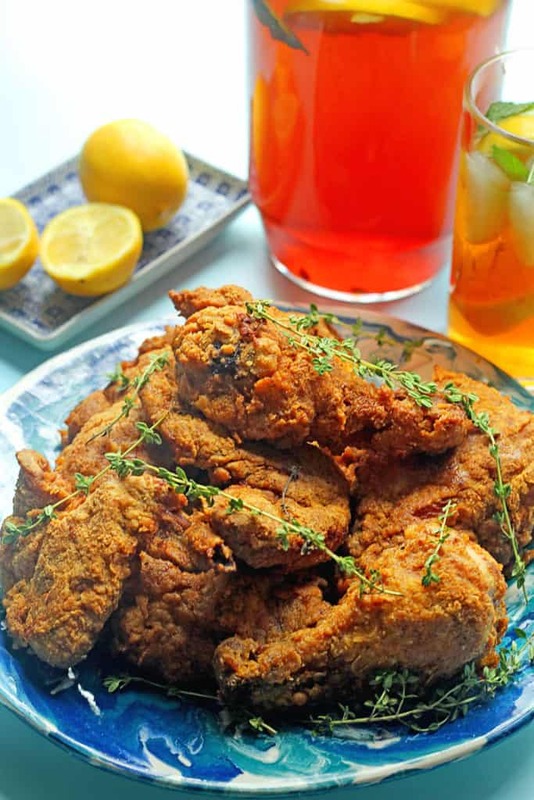 Sweet tea fried chicken recipe: Southern sweet tea becomes the perfect brine for a twist on classic fried chicken! Savory and Sweet combined! Well the week started with classic sweet tea but now it’s ending with fried chicken. It seems like a natural progression to me. 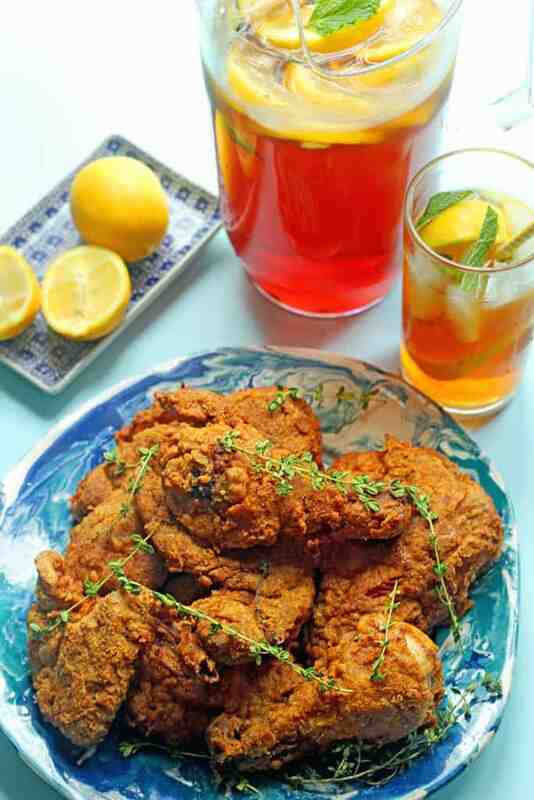 Sweet tea and fried chicken go together in more ways than one. I have found that if homemade fried chicken is on the supper table in my family, sweet tea isn’t too far behind. In fact, Sunday Suppers more times than not included fried chicken and sweet tea. Nothing makes you feel warmer in your bones or spirit than this comforting combo. Now, I have shared quite a bit about my Southern inspired upbringing, and a ton about our skill in frying chicken. The thing is I never get tired of sharing my love of it. It just never gets old in my opinion. It is the classic that keeps on giving without the shadow of a doubt. The only thing I can do is switch it up from time to time. 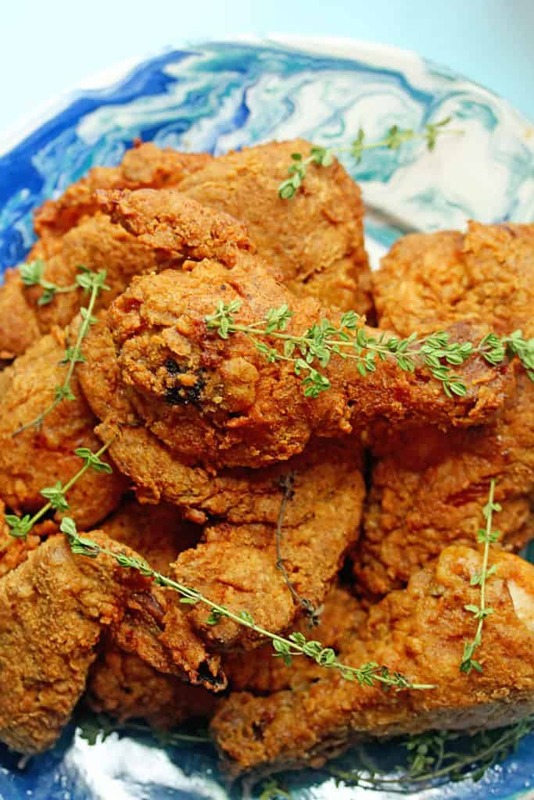 That’s where this Sweet Tea Fried Chicken recipe comes in. I hardly ever have left over sweet tea but this time I doubled my tea recipe, adding half to a pitcher in the fridge and adding the other half to a bowl to brine some chicken. I used my favorite seasoned flour mixture from my traditional recipe to make this recipe. I brined the chicken for 48 hours because I wanted the sweet tea to totally seep into the fiber of the meat. The sweetness was unbelievable in contrast to the salty flavor of my seasoned flour. Sweet and salty is an amazing combo, and in this Sweet Tea fried chicken recipe it takes on a life of its own. I loved playing with new flavors with my good ole’ fried chicken. In fact, I am frying up another batch right now to put on my family dinner table, along with my easy homemade garlic bread recipe and a heaping tablespoon of love. What is a chicken gizzard? This fried chicken gizzard recipe will make you the ultimate fan. I’m seriously in love with this chicken fried steak recipe! It is one of my most popular recipe. This Country fried steak is gold! 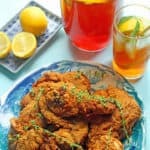 Savory and "sweet" tea fried chicken: Southern sweet tea becomes the perfect brine for a twist on classic fried chicken! Heat water in a medium sized pot until boiling. Turn off heat and add tea bags. Let tea steep for 20-30 minutes then remove bags. Stir in sugar and lemon juice until completely dissolved then let tea come to room temperatue. Add tea to large bowl then submerge chicken pieces in tea. Refrigerate for 24-48 hours depending on level of sweetness you want your chicken to have. In a medium sized bowl, whisk together eggs and set aside. Add flour, seasoned salt, cornstarch, paprika, cayenne pepper, black pepper, garlic powder and onion powder to a paper bag and shake to mix well. Dip each piece of chicken into egg wash coating both sides then dip into seasoned flour thoroughly coating each piece. Then add piece to baking sheet to rest. While coating sets, add 1-1/2 inches of oil to a cast iron skillet or heavy bottom skillet and heat over medium high heat. Also turn on oven to 275 degrees. Fry four pieces at a time on each side starting with dark meat since it takes longer. Make sure you don’t overcrowd the pan. After each side has turned slightly golden, put the top on the skillet to steam the inside of the chicken ensuring doneness. After a couple of minutes, remove the top and continue to fry until the crust is crispy again and completely golden brown. Remove chicken from oil and place on paper towels or rack to drain. Place chicken on a baking sheet covered with parchment and add to warmed oven while finishing the other chicken pieces. Fry the remaining chicken pieces and drain and add to oven. Add the remaining chicken to the oven. I officially luvz you! : ) All these recipes really made my day, reminds me so much of my Mum! Thanks so much for the love however I don’t have the pig tail and ears recipe unfortunately. I made this chicken for my husband for Father’s Day. He said it was the best and most flavorful chicken he had ever had! I normally bake chicken and was a little intimidated to fry it, but I’m glad I did. My 11 y.o. twins loved it as well. Definitely going to be my go to recipe! Thank you for sharing such a magnificent recipe! Oh that sounds amazing. Let me know how that turns out! Fantastic! What a great idea. I hope you enjoyed it all!!! This looks absolutely AMAZING! And easy too. I’m also one of those people who are afraid to fry anything LOL. I’m always afraid I’m going to mess it up. But you really explain each step very well, and I think I can do this! I’m going to give it a try for the next potluck this summer. I figure if I’m going to heat up a bunch of oil, I might as well fry for a crowd. Hooray I hope you enjoy it! I cannot have fried foods at this time, but this recipe sounds amazing!!!! Would it work baked in the oven and if so, how would I need to adjust the recipe? It just looks so good that I want to start a jug of tea tomorrow just to see how it would taste!!! My second batch of chicken never looks great like the first one. It seems like the outside layer cooks quicker than the inside resulting in a burnt crust. Any suggestions? What skillets or pots would you recommend frying chicken in? Also check your oil after you take out the first batch of chicken. You sometimes need to adjust the oil because it changes after the chicken is removed. I love a cast iron skillet for frying. I want to make this recipe or big mama fried chicken recipe for labor day. Can you help me choose, they both seems tasty. Don’t make me lick my screen!! Cause, I’ll do it!! These look simply scrumptious! You always come up with the most innovative and original ideas with your recipes. This one had summer written all over it! This chicken looks so good!!! I was intrigued by the title and now I really must try this recipe. Yum!!!! All those flavours in the crumb. Oh yes!!!! Pinning this one into my chicken recipe board! Two of my favorites – sweet tea and fried chicken!!! I bet the sweet with the spicy is amazing! I ADORE fried chicken and this sounds so original and fantastic! I love the idea that you brined it in sweet tea! Thanks so much hon! The sweet tea brine is fabulous! That chicken looks ridiculous! Seriously, you’ve given me a huge fried chicken craving! Love that you’ve marinated it in sweet tea first. Your photos are always killer! I had no idea you could do this with fried chicken, but the flavors must be incredible 🙂 Way to put sweet tea to a new use! I smelled this chicken a million blogs away!!! I call the leg/thigh…. LOL! Oh you can totally have it girl. Imma a white meat kinda gal lol. oh my gawd, I LOVE that you used your Southern sweet tea for the brine!!!! Amazing!!! and LOVE sweet + salty. . it’s the best! The fried chicken looks amazing!!! All I am craving right now is a good plate of fried chicken. This looks seriously amazing.. and is more than my taste buds can handle right now! What a delicious way to merge two 2 of your favorite things into one dish! This chicken looks incredible! Yep get it going girl! Such a creative way to brine the chicken!! I bet it’s amazing. I haven’t had good fried chicken since Hattie B’s. I need some now! I was ready to give up fried foods for a while. However, I have to try this chicken first! Don’t give up until you get this in your belly. You are totally my source for all things fried chicken! I had absolutely no idea that you could brine chicken in tea. It sounds pretty much like the best meal ever. So even though I am somewhat terrified of frying chicken, I really want to give it a shot now! I am pleased to be your fried chicken source. Oh my! Girl, I’m madly in love with this recipe. I’m a huge fan of fried chicken (southern fried chicken, to be exact) and this recipe is super genius. Love the flavor so much. What perfect timing! I am tossing around the idea of fried chicken for Felix’s first birthday party. I am just not sure I want to fry up chicken for 20. This looks wonderful! Oh yeah that might be a ton but you are pretty awesome for even considering it! Oh wow what a unique flavor addition to a classic!! Love it!! Do I rinse the chicken once I remove it from the tea or do I take it out of the tea then dip it into the flour mixture? This sounds absolutely fantastic! What a great idea! Oh no go for it! You can do it!